Captive reindeer are seen being kicked and abused at a centre in Kent in undercover filming carried out by animal rights activists. Animal Aid set up cameras at The Reindeer Centre near Ashford and said what it found was "shocking". Twice, a staff member was caught deliberately booting the animals. The centre said the employee had been "dismissed as unsuitable". Animal Aid also raised concerns for deer in Staffordshire and Cheshire. An RSPCA spokeswoman said: "It is never acceptable to kick an animal as seen in this footage and when we were alerted to it we sent an officer to the scene." 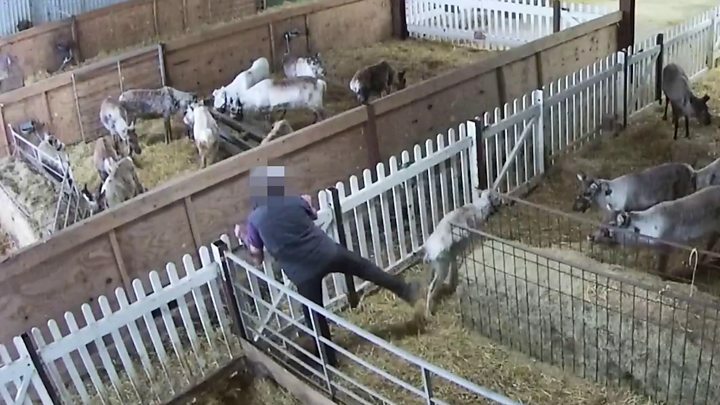 The Kent footage was shot between November 2017 and spring 2018, and the centre was reported to the RSPCA in May. The film was released publicly by the group on Monday to raise awareness ahead of the festive season. Campaign manager Tor Bailey said: "Our investigations have revealed the shocking suffering of these gentle animals. "I would urge the general public not to support events which feature live captive animals, and find other more animal-friendly ways to enjoy the festive period." Image caption Reindeer at the Kent Reindeer Centre were found with "raw, exposed skin"
A spokeswoman for the reindeer centre said all its animals were "much loved and well cared for", and added: "The person involved was one of several new part-time staff that we took on to help out. He was dismissed as unsuitable after a short period of time. "These matters were discussed in full with the RSPCA and our vet back in the summer. "We understand people's concerns and distress and I can only confirm we as a family care passionately about our animals." Image caption In Staffordshire, one deer was found with what Animal Aid said was "severe fur loss and skeletal abnormalities"
Animal Aid alerted Kent Trading Standards officers in May, but Ashford Borough Council was already investigating the centre. It had "concerns about animal cruelty" so referred the centre to Kent Police. The force said it had no record of the report. When Trading Standards officers returned to inspect the centre later in the year they found "no particular concerns at that time; one of the older animals was thin but not to the point of malnourishment, just age". At Blithbury Reindeer Lodge in Rugeley, Staffordshire, an animal was found with what the activists described as "severe fur loss and skeletal abnormalities". However, owner Stephen Swinnerton said the deer he kept were all "happy and healthy". The deer pictured, he said, was 17-year-old Forest, whom he delivered as a calf but who had developed arthritis causing him to appear "bow-legged". Forest had to be put down, to the "great distress of Mr Swinnerton and his staff", shortly after the picture was taken. Image caption Deer at Cheshire Reindeer Lodge were found "in barren conditions with no food"
At the Cheshire Reindeer Lodge, now permanently closed, some of the deer were said by campaigners to be malnourished and kept in a barren yard which had nothing in the way of grazing. More than 570 reindeer were imported to the UK between 2014 and 2017 from countries including Sweden, Finland and Norway, government figures show. The RSPCA said: "We are really concerned that every year, reindeer are used across the country at festive events and exposed to a busy environment, surrounded by crowds, noise and lights, and this can cause these semi-wild animals a great deal of stress." Animal Aid is a national group, set up in 1977, to protect animals. Its work has let to a number of convictions and successful campaigns, including #MarkItVegan for supermarkets to appropriately label their products.